Slightly sweet, ultra creamy– this Mango Lassi is a healthier, dairy-free, and naturally sweetened recipe. Mango Lassi is served at many Indian restaurants, it’s typically a fairly sweet, yogurt-based drink. This recipe uses cashews for the base and is sweetened with dates, a fruit that can also serve as a natural sweetener. 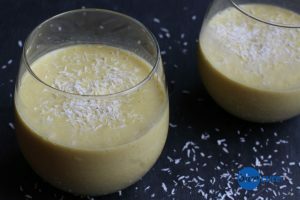 Enjoy the Mango Lassi as a sweet treat after dinner or even as an afternoon snack. Add a frozen banana to the mix to make it into a delicious smoothie– or even toss in some berries! Use this recipe as the base, but go ahead– be creative! See our Ten Tips for Healthy Living to learn why men should limit or avoid dairy products. Cut the fruit off the mango seed. In a high speed blender, combine the mango fruit, dates, cashews, cinnamon, water, and ice. Adjust to taste and texture. Serve chilled or over ice. Enjoy!